As promised, we're back with a final indoor planting project for the week. Our kitchen window is beginning to get overrun with plants in various stages and we're loving it. We've decided to try our hands at growing sweet potatoes — we've really got nothing to lose other than half a potato if we fail. After picking up 3 more large sweet potatoes over the weekend to make more of our own sweet potato dog chews, we decided to see if we couldn't try to grow some of our own. Yes, we have lofty dreams of growing bountiful potato vines that supply our natural dog treats and recipes, haha. More realistically, we'd just be happy if we were able to get one good potato to grow this first time round and build up down the road as we learn. To get potatoes started, it's not quite as simple as planting a seed. 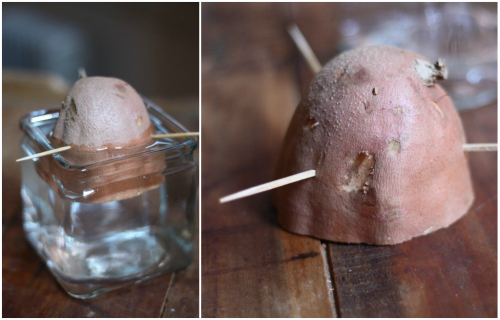 We decided to go the route similar to our avocado plants by cutting the potato in half, inserting 3 toothpicks midway into the halved potato and resting it in a shallow vase of water. 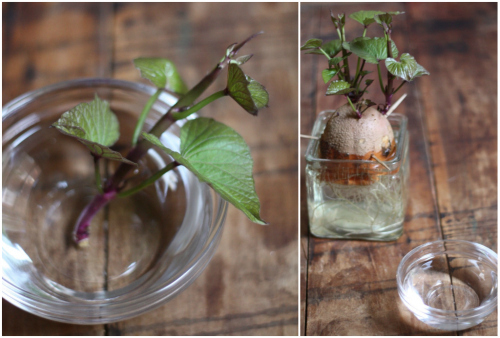 With the cut portion of the potato resting in water and the upper half exposed to the air in a sunny window, supposedly roots will begin to grow from the bottom and stems from the top. Some references said up to 50 shoots could sprout from the top, all of which could become their own potato plant. There is a process for pruning and planting the stems in order to get successful potato vines, but we'll simply try our hand at getting this guy to sprout before tackling anything further. Wish us luck — we'll keep you posted if we have any! 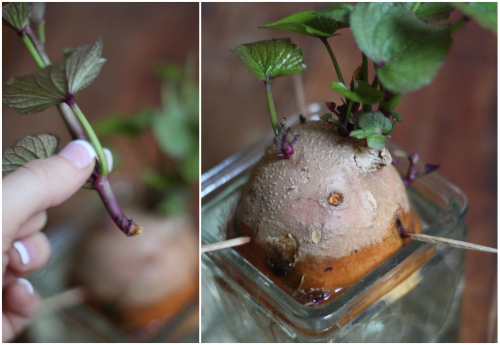 Read even more about the potato sprouting stems and roots in our mega plant update. Read about how to twist the slips off the main potato and get them prepared for root growth right here. 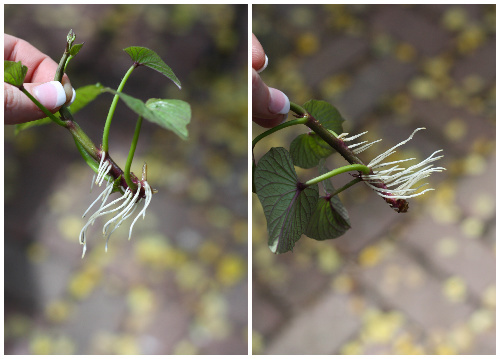 Read all the details about their root growth and exactly how we planted them outdoors right here. 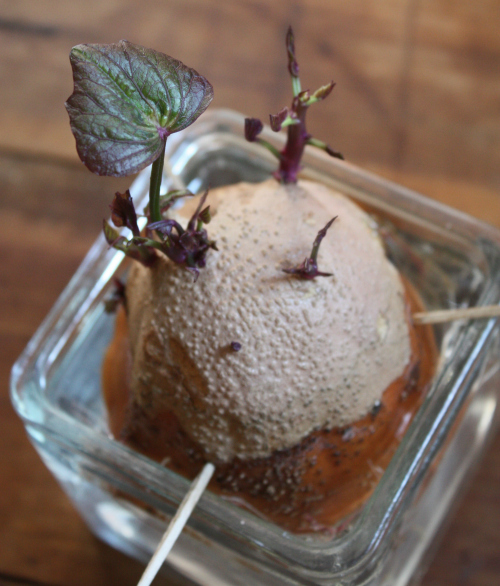 Read more on this latest update and the new batch of purple potato plants we planted here. Read more on this latest update with the full details on how we built out the supports here. For those interested, we bought the additional potatoes to try making thicker, more substantial dog treat chews for Basil. Our first batch was very successful, though lacked that thickness and "meatiness" we were going for. This go round we simply chopped them with a sharp knife in much thicker portions — 3/4 of an inch each give or take. The dehydration process took about twice as long, but when these guys came out of the oven, they were much closer to the look and feel we were going for — plus they take that much longer for Basil to chew through. 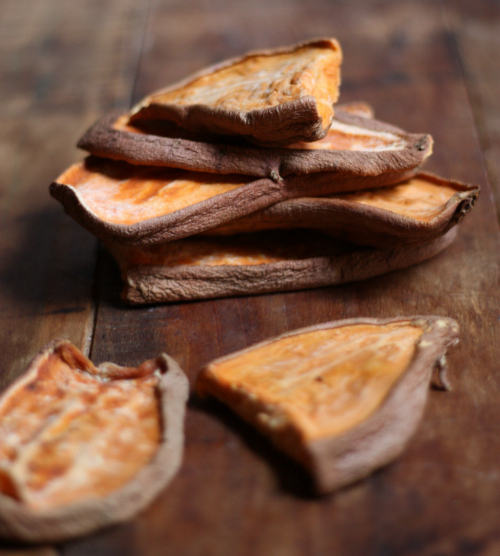 Find the full recipe for our version of the sweet potato chews here. P.S. We're thrilled to be named among many blogs nominated for the Apartment Therapy "Homies Awards" in the DIY blog category. Today is the last day to vote and we'd love yours for 17 Apart! Click here to vote and scroll waaaaaay down the list to find us. While over there, be sure to check out the plethora of other awesome DIY focused blogs — it's a pretty amazing list. Thanks to all that voted for us already! These look fantastic! (for my dog...but me too perhaps :) I can't wait to try them, my Golden loves sweet potatoes, I have always steamed them for her, I know is is good for their coat. But these look awesome...Thanks for the tutorial! I'm guessing that the new vines will need to be transplanted out doors for the sake of room? Exactly! We just planted them outdoors in large containers and are looking forward to sharing just how we went about it on the blog this week! What about taro, or lotus, or lemon grass? Always wondered if those could regrow. Oh love these ideas! We will definitely look into these. I have heard that you can regrow lemon grass. May have to google it to confirm. Yeah, try lemon grass. I have had all kinds of trouble making it work from seeds. Rae - great suggestion, we hadn't thought about lemon grass yet. This is a great post. 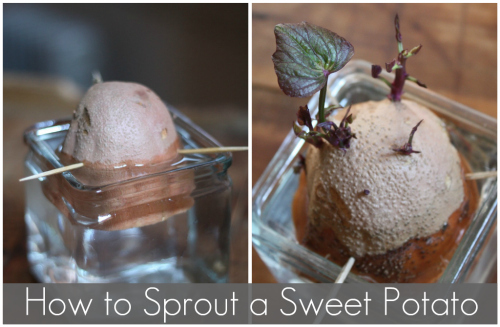 I love sweet potatoes and heard that to plant sweet potatoes doesn't need a huge land of soil. Is that true? Will try to work with the slips first while waiting your reply. Thanks. 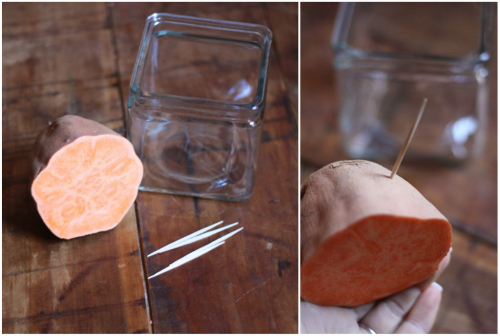 Can you grow sweet potatoes in a container? Do they grow like potatoes so that you can steal a potato from the plant? Hey there - yes! 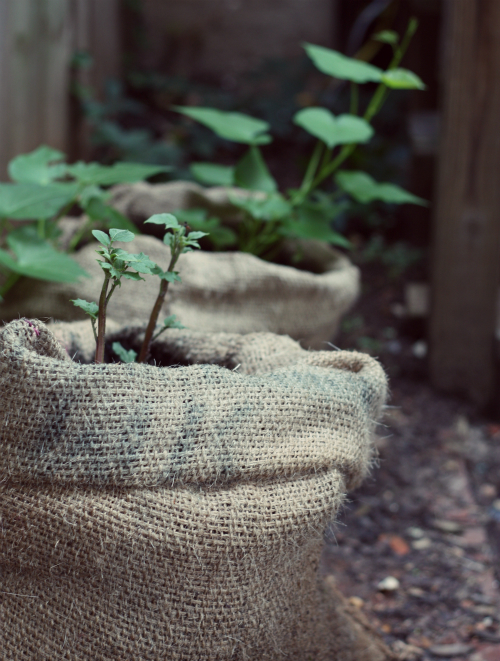 We have been planting ours in container bags — they grow as roots underground like regular potatoes — you can tell when they are ready once the vines start browning closer to fall! Oh no! We are so sorry to hear this! We have heard it also works with a whole potato instead of a half if you want to try again! I experimented with potatoes and planted some and then threw a partial bag of growing potatoes that had been unused, they are going crazy of course I have added mulch that has composted over the years and vermicompost all organic and I loveeee playing in the dirt and eating what I grow and the kids all love it too. Thanks for posting the ideas. I am going to try a few. 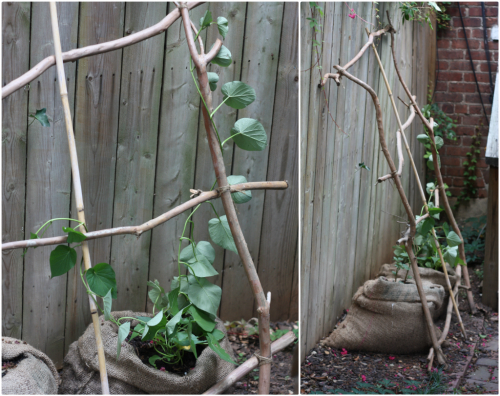 Wow, so glad to hear your potatoes are growing like crazy — it's amazing how quickly the vines grow once they get going! The potatoes from the grocery store are stayed with a debudding solution. It just rots..
2) Buy an organic sweet potato. They are NOT sprayed/treated. did you use an organic sweet potato or one from a grocery store like Price Chopper.....the ones at the grocery store have had something put on them so they will keep longer a sprout inhibitor.....at least that's what ive been told, I didn't have any luck until I got an organic one from sprouts or whole foods. The dog chews are a brilliant idea!! I can't wait to try them...for my dog of course! So glad you like the recipe — hope your pup loves them! I've heard that some companies spray a chemical on their sweet potatoes which prohibits sprouting, so it may be hit and miss. The burlap sack is an interesting idea. I planted three different varieties in containers outdoors. They're in partial shade and looking good so far. I'm afraid to put them in full sun for fear of drying out in the container. I would like to see an update on your progress. Have you felt any fruit yet or are you afraid to disturb? Hey there! Great point on the potatoes — we went with a local organic version to avoid any chemical sprays, maybe this is why we had good luck. Our potatoes have really taken off in the bags, we are due for an update! We haven't felt for fruit yet for feat we will disturb them but are hoping for the best! Thanks for the update. Looking good! 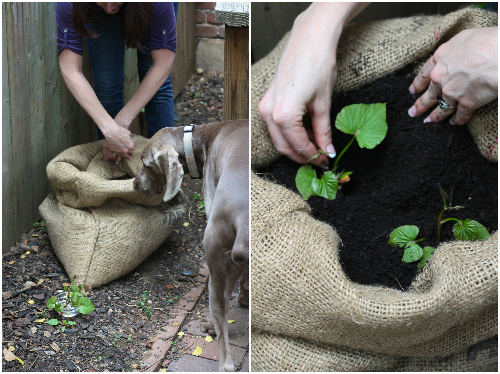 I liked the burlap sack idea so much that I bought a few to try for myself. I filled them with sandy top soil and some decomposed manure. I had a few sweet potato plants left over from my container garden so they'll be my guinea pigs. Crossing my fingers. That's awesome - we hope they take off for you. The sandy soil and manure mixture sounds perfect. Thank you for the updates, they're great help. 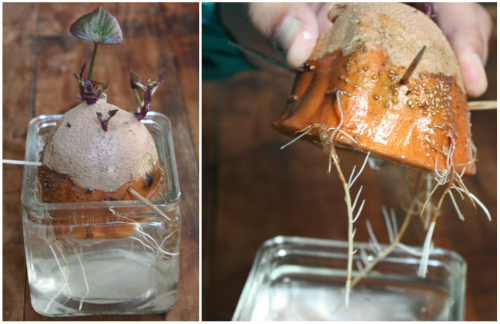 I have a question, my name is Maria and I am growing a sweet potatoe in a jar. I know it's alive and has sprouted lots of roots... but no shoots with leaves. The story: I planted the tube over a month ago... the first two weeks I submerged it in water but with the bottom side up without noticing until my granddaughter told me and I fixed it right away fearing I had drowned the poor thing. However, after a week it was already shooting roots! I was so happy... but I have waited to see the sprouts and they don't come... what should I do, plant it in soil?, should I cut off the tip? I don't know... oh, I live in a rather cold area of the tropics... I have sunny times by the window in the dining room but later in the day it gets cold. I've been placing my jar near the window during the day and then on the counter inside in the late afternoon and for the night... also, I'd like to keep it on the fridge in my kitchen but my kitchen window doesn't get direct sunlight... it's rather dark and I keep the light on during the day... however, the roots sprouted there... can you help me? I feel like putting it in soil and potting it because I wouldn't like for it to die... my e-mail is iriarteleon@gmail.com... I could send you a picture of it if you wish... if so, where would I send it? Mariapaz we would be happy to take a look and you can just hit the "contact" link under our title picture or just send it directly to 17apart@gmail.com we look forward to seeing your progress. Oh wow Caleb, how creative and clever. I bet the seaweed really adds a punch of nutrients as well! Thanks for sharing! 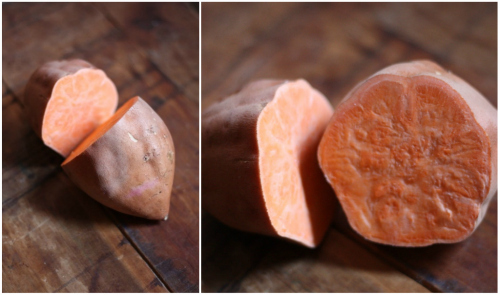 Thank you for the info and pics about the dried sweet potatoes, just what I was searching for online! So glad it was helpful! Can't wait to hear how it goes for you! 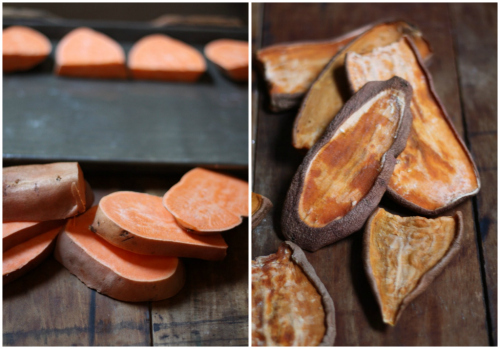 have you harvested any sweet potatoes yet? i am so curious about this. it is too late for me to plant them this year, but i certainly will next year if it that simple! i love dehydrated yam chips for me! with a little olive oil and himalayan salt....maybe some fresh herbs like rosemary toss in along with the oil and salt. yum, yum! We haven't made a harvest yet, but our vines are growing like crazy. We are waiting to see the purple flowers, evidently this is when we know that potatoes are actually forming underground, which we haven't see yet. We will absolutely update here on the blog as soon as we know! what about avocados? can you grow them in a burlap bag also? Maybe I will try. Hey Sandy, I bet you could — let us know if you end up trying! Amazing! I just stumbled across your blog here after seeing a picture on facebook that someone had linked. I have some left over small mason jars that would be perfect for a lot of these re-growing ideas! Awesome — so glad you stopped by and hope you will keep us posted with your progress! PS - I don't suppose you have any pet recipes that could be modified to satisfy two feisty and picky felines, do you? Great question — we aren't as familiar with what is best for cats, but it's always worth a shot with natural ingredients! If we had a cat, we might try our hands at salmon cakes! do you know you can eat the potato leaves? very irritating to clean and prepare (need to peel the skin off the stalks) but you can blanch it quickly and serve it anyway you like. problem is if you keep harvesting the leaves, the chances of the potatoes to grow decrease... last time i uprooted a very old batch of sweet potato plants, the roots were just starting to turn purple after 5 months. These dog biscuits are really good, I have read somewhere........... that if you put some in a tin to keep softish for humans. They, apparently, dry out so much that they are hard and then of course, who benefits? I will tell you that the mad mutt here is looking very smug nowadays! Basil - you can stop rolling around that floor laughing now - dog lackeys can be trained too you know! Hi, love your blog. How often should you water once they are in soil? Well you do not want to drown them but I would say keep the soil moist watering every other day or so if there is no rain. Thanks for following along! Wow that is great potatoes are surprisingly resilient. Our best advice is to leave it and let it do its thing. It can take weeks even a month before things start to happen. They eventually will though! Good luck! did I miss a link to the harvest results? Keeping it real here on the blog! Don't give up on the advocado Aida. My five advocado seeds finally sprouted after 3 months on the window sill. Only two out of five have actually made a tree. One has leaves on it. I am going to try the celery and the sweet potato. I have a bucket of green onions growing right outside the back door of the kitchen. Whenever I want onion I go outside with my scissors and cut what I need. Same thing for purple basil. I have organic garlic growing in my compost pile. Can't wait to see how it will do. Thanks for the blog. So much fun growing this food for ourselves. I love it. A word of warning. 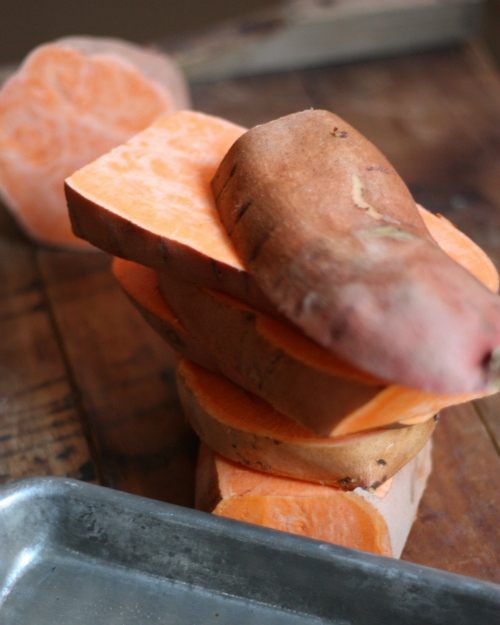 Some terrier breeds are allergic to sweet potato. If your dog starts really scratching and chewing themselves look for bites if you do not see any then it is probably a food allergy. Many dogs are extremely allergic to corn and some are allergic to sweet potato. I'm so excited to try this out. How much sun light should the potato be exposed to. Should I keep the potato near a window. I really like this recipe and I'm going to try it for my dog Dozer . I make Sweet Potato Treats all the time, but a little differently. I clean them well with a vegetable brush and cut 1/4" slices like chips, not lengthwise and blanch them in cool water for just a couple minutes. Put them on cookie sheets and Bake at 250 Degrees for 1 hour and turn them over and bake another hour . After that every 30 minutes flip them over until their like Beef Jerry . I store them using silica packs so they stay fresh and don't mold . My dog Dozer Loves them and He wants nothing else . Their His Absolute Favorite ! Just set a sweet potatoes upon a pot of cocoa core that has moisture within ; not saturated with water rather damp and leave it there eventually it'll take root..
Sweet potato leaves are so yummy in a stir fry! Do try it! Such a waste to throw away the leaves. I just put the avocado pit in a pot outside in the spring. Eventually it sprouted, but I don't remember how long it took...just keep on watering it. Omg! Thanks for the info! I accidentally separated a slip from the potato and I panicked. 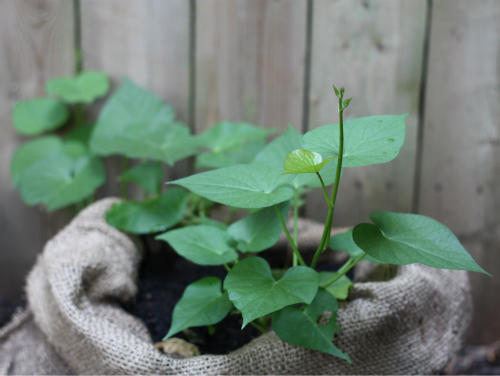 I love the post, I can't wait to get started growing sweet potatoes! Thanks! Wow, this post is years old, but helped me the most from all the other blogs out there. I bought a sweet potato I forgot about and the next thing I know, the vines started to look like something out of Little Shop of Horrors! I didn't cut the potato like you and others recommend, but just stuck the bottom in water and now the vines are a few feet long and taking over my kitchen. I am getting ready to plant outdoors, but my yard is filled with a clay/sand soil that nothing but weeds grow on so I need to build up a good area and block off with bricks to allow them to grow properly. I'm worried about how to control the vines though. Mine don't seem to grow up, but sideways so how do I keep them so they grow upwards, if that's possible? Do I prop them up with sticks, as you did or if I plant near a chain link fence, will they grow up that? Thanks for the kind words and for taking a look! Yes, you can use a bamboo stick but they do grow pretty crazy and up against a fence or railing may work best. Thanks for checking in and good luck!